Stand back, there’s likely going to be a spray of dust as this post comes up – been a few days (okay, weeks) since I’ve put one of these babies out. To be honest, I’m reaching new levels of busy around here with absolutely no sign of let up until after Halloween. Last week was another big event which is finally past (yes, post to come) but all my free time at the moment is being directed towards my huge Aaaauuunold Project. However, this is NO excuse to miss a month quota so on with the show! Today marks another appearance of bird that is secretly growing in population around here. Up until the last 3 or so years, it was common to drive miles and miles without seeing this particular bird intently scanning the ditches and fields alongside the highway. Nowadays you are likely to spot one every 5 miles or so. I cannot tell if this is an indication that rodent populations are thriving or they’re taking a page from the rabbit play book. The good news is there are plenty of opportunities to get shots of these birds of prey around here. 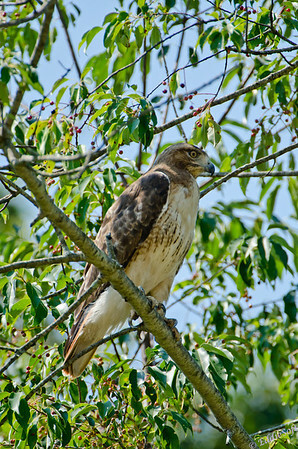 In case you live in a cave, this is a Red-Tailed Hawk. As mentioned, it has actually shown up a few times on this blog with the most memorable post being the snake sighting (link here). There have been a few other Phoadtography posts that had some shots as well, but none of them allowed me to get this close to the specimen. This particular set of images came from a sighting about 2 miles from my house. On my way to work I had noticed this bird hanging out in dead tree watching the cars go by, but my calendar was full and thus had to pass up the opportunity. On the return home I was giving some extra scans along the treeline to see if another opportunity might be had. Sure enough, it had taken up a position about a quarter mile closer to my home. This was too good of an omen to pass up so high tailed it to the house, grabbed the Beast and headed back. Unfortunately, it was backlit by the sun making it difficult to get the shot I wanted. 5 shots later it spotted the huge glass pointed at it and became very skittish – can you blame it? It turned away from me and took flight up and across the road. This put him in much better composition position. More cautious this time, I moved the truck up into position across from it. This worked muuuuch better. This allowed me to snap a number of shots playing with the shutter speeds and aperture settings in an effort to pull it out of the tree branches and leaves. For the most part it kept its eyes on the ground looking for dinner. I must have made a noise or the glass caught a glimpse of the sun because it immediately became very aware of me. Looking through huge glass really amplified how lethal that beak and those sharp talons looked. True to Gary Larson’s cartoon, birds of prey know they are cool. Clearly it was not really comfortable with my presence especially since I had tracked it from the previous perch. A few minutes later it opted to seek more solitaire settings which led to my favorite shot of the set. 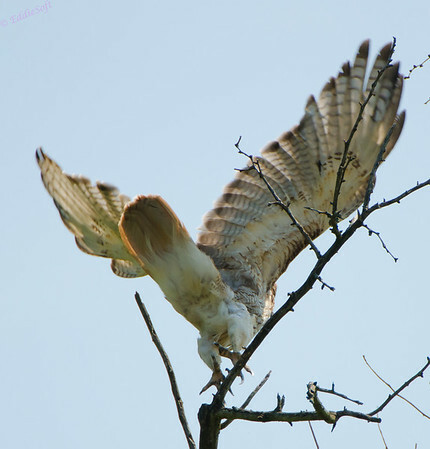 The beak is just slightly clipped, but you have a good view of the talons and the underwing markings. Speaking of the underwing coloring, I included the following shot from the initial location. 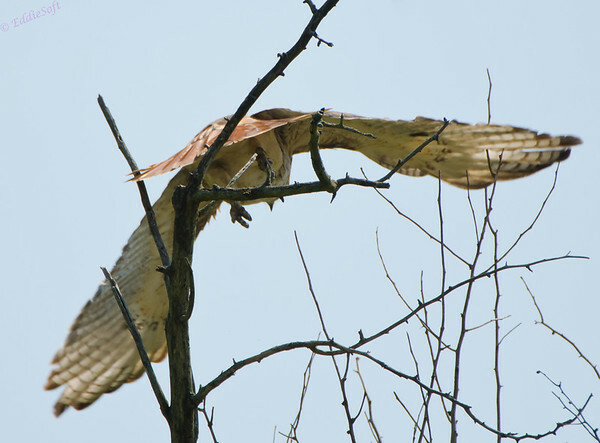 Being in mid launch you can see the entire wing coloring as well as the signature tail markings that lead to its name. Oh, and another shot of those deadly talons. 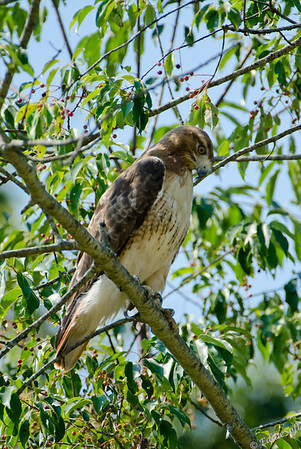 Not gallery shots per-se, but it is very handy when trying to verify the particular Hawk… or should I say Chickenhawk. To be honest, I was not aware of that fact – I remember that term being used in my childhood but somewhere along the road I stopped hearing that term with the exception of some old cartoons. 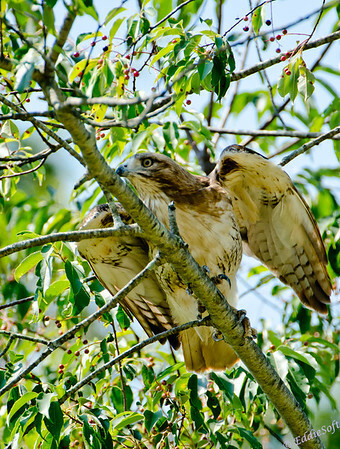 Apparently the birding societies decided to eliminate that term since it really didn’t apply to the species – none of the three types of hawks this name is attributed to (Coopers and Sharp-Shinned being the other two) really rely on chickens as a steady diet – rodents actually make up the largest part of their consumption. Credit to my friends over at Wikipedia for that tidbit of knowledge. Females range in the 2 -4 lb range with the males only in the 1.5-3 lb size. 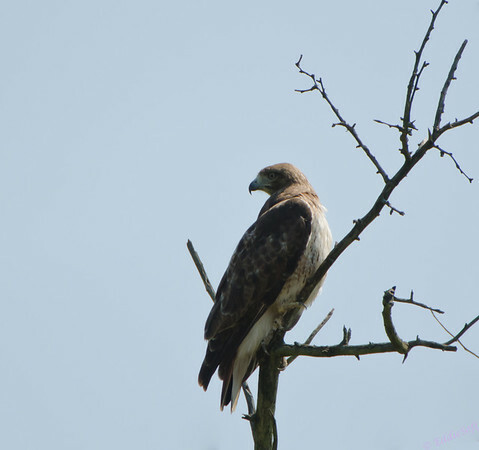 This particular specimen is considered an immature (hawks mature in the 3-4 year range). Any guesses on how ‘I’ know that? Yes, there was a hint in that sentence. Immature eyes (as in my hint ‘I’) are yellow tinted. When they make it to maturity their eyes begin to darken. Living in the country with a 5 lb show poodle forces you to keep an eye out for these predators. Our Kerby can look like a large rabbit after dark making it a tad risky to let him roam unattended. I can’t imagine the psychiatry bill if Linda would ever witness her baby being carted off by one of these birds – the good news is we have plenty of rodents in the area to feast on instead – if only I could teach them how tasty moles are! I might as well throw in the best shot from the original back lit position. This took a lot of post processing just to get it in this mediocre shape. The annoying thing is it was in my signature pose (head back across body) but I failed to deliver – well, not entirely sure I could have pulled much more detail out of it without completely blowing out the sky but I could have done some bracketing on it since it was staying pretty motionless. Hope you enjoyed. I’ll try to get a few more out in the next week or so – I have all the topics for the month .. just a matter of finding some hours to get them typed up. Interesting, I didn’t know what a Chickenhawk was, and I only remember it from Loony Tunes. 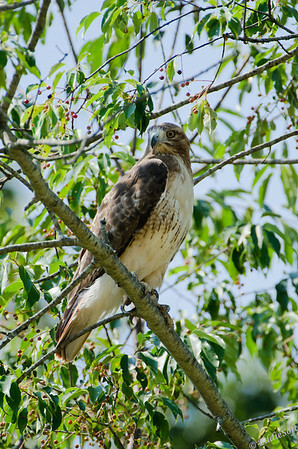 I thought there was something else, like a whiter belly or lighter red tail, that indicated a juvenile. Not bad, not bad at all. But I’m exhausted. This stuff doesn’t just write itself, you know. Wasn’t Foghorn Leghorn or something like that a chickenhawk? wait .. thinking while type here .. sorry – think there was a smaller yellow bird that was actually trying to kill Foghorn because he was the chickenhawk and Foghorn was some kind of behemoth chicken or rooster rat .. I obviously don’t know for sure but I’m resisting the call of that Google text box at the top of my browser out of sheer contempt for their smuggy know it all search engine.